For all the Type A wives who are yet to be moms, and the Type A moms who only have one or two children ;). So… well… it’s no surprise that I am Type A. I’m less Type A than I used to be (more on that later), but that is most definitely my tendency. 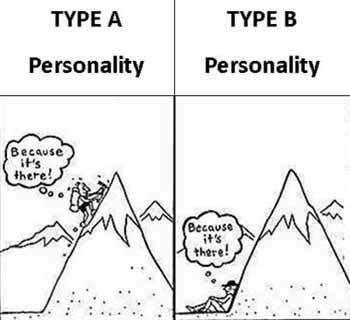 I’m not sure that these Type A and Type B are actually official, but in a nutshell Type A women are more organized, go get ’em, and on top of things. Type B are more go with the flow, no worries, and easy does it. Strengths (mostly): highly independent, take charge, decisive, direct, business-like, ambitious, efficient, motivated, persistent, focused, risk taking, practical solution oriented, dislike routine, high achieving, no-nonsense, multitasking, deadline driven and change oriented. Of course it’s a great thing to be dependable, organized, efficient, and full of leadership potential. I mean just look at the resume for a stay at home mom, for example. However, that comes with the feeling that we are in control. Because we’re able to run a tight ship and make things happen we erroneously think the world is on our shoulders. We think if want it done right we must do it ourselves. We don’t want to wait for others to “get around” to doing what should be done now. We are hesitant to delegate because we think we can do it better. We are quick to think others are lazy. I’ll be honest, lots of people are lazy, but our trouble is we over function and blame it on others. So… after having a slew of kids in a short period of time I’ve made some serious strides in getting rid of the weaknesses of a Type A woman while still maintaining many of the strengths. And I attribute it mostly to having 4 kids. Here’s why Type A women should have lots of kids. 1. You’re confronted with reality. Type A women can have a skewed version of reality because we tend to think we’re in control. Oh sure we’re in control of some things in our life (and should be), but we are not in ultimate control. And in fact, feeling as though we’re in control puts such a heavy burden on our shoulders that we are near to crumbling too often. God is ultimately in control and I’m able to make wise decisions and then life happens as it does. The best laid plans fail. The unplanned project succeeds. We do our best, but we simply can’t control it all. And having all these kids is the quickest way to realize that. Colds, sicknesses, behavior, their choices… we do our best but we aren’t puppet masters. 2. You must ask for help. We Type A women tend to think that we can do it all and don’t need help. Don’t need to delegate, don’t need to wait for others to do it badly because then we’ll have to do it again anyway so may as well just get on with it. However, the more kids you have the more you have to get rid of your pride and humble yourself to ask for help. This will often help when you’re in the middle of surviving the newborn phase. Before with one or two kids you’re like, “Oh, I got this.” Keep the kids coming and you soon realize you’re outnumbered and pretty soon you feel no shame to ask for help. That feeling of being able to do it all and have it all and make it all happen is laughable now. Pa ha ha ha ha. No, no, it can’t all get done. Or it can, but only with help. Or hiring help. Either way, you lose that proud place in your heart that says you are in it alone. 3. You don’t have the time to sweat the small stuff. The things that Type A women worry about would boggle the mind of our dear Type B sisters. We worry about towels all folded perfectly and things being color coded and drawers being lined and edges of sidewalks being in order and all the toys lined up and no toothpaste on the counter and all these things. And I’m here to tell you these small worries add up. Before kids the Type A woman takes the time to do all these little things and feels a cocky pride that her environment is so orderly and just so. Then you have a slew of kids and toothpaste is everywhere and wet underwear from your “potty trained” toddler are lost though you can smell them, and ugly plastic toys fill the backyard and you don’t care. You don’t care because you do what you can, organize what you can, put in order what you can and you flipping stop sweating the small stuff. Or rather, your meter for what is small and what isn’t gets put right. 4. You learn to delegate. Before if I wanted things in the house to get done I used to make sure I did every little thing and then checked it. I’m so over that I could laugh the house down. Now, if something gets done then it’s done and that’s that. These kids gotta buck up and help because there’s simply too much to do for one woman to do it. Before, I would have felt it a matter of pride to have it all under control. Now, the weight of this burden is lifted as I realize that teaching children how to help is a gift to them. And it’s a gift to me. And it is helping my tendencies to let others do things without trying to control everything. Sure things aren’t done the way they would be if I could do them myself, but that doesn’t even bother me anymore. I’m just happy that I don’t actually have to do it all. In fact, I never did. 5. You’ll raise go getters and the world needs that. I’m not saying Type A moms have the monopoly on raising leaders, but I think we’re set up for success. I stay at home and watch the kids and work from home and have plans and projects and my eye on the future. These are good things, and it can’t help but rub off on the kids. Last month there was a 5k and I signed us all up. My mom pushed my 18 month old, I pushed the newborn and my 3 and 2 year old walked. The whole 5k. Well, minus a few bouts of carrying. Before going it never even occurred to me that it’d be difficult for them or they wouldn’t want to do it. In fact, they didn’t even complain. We were dead last and the others who ran said we deserved a medal, but in my mind it was just fun. The kids did not have one meltdown nor did anyone cry. They would run and sprint then walk and look at pine cones and drink water and stop. And we’d go. And they were dismantling the tent when we passed the finish line, but we did it. 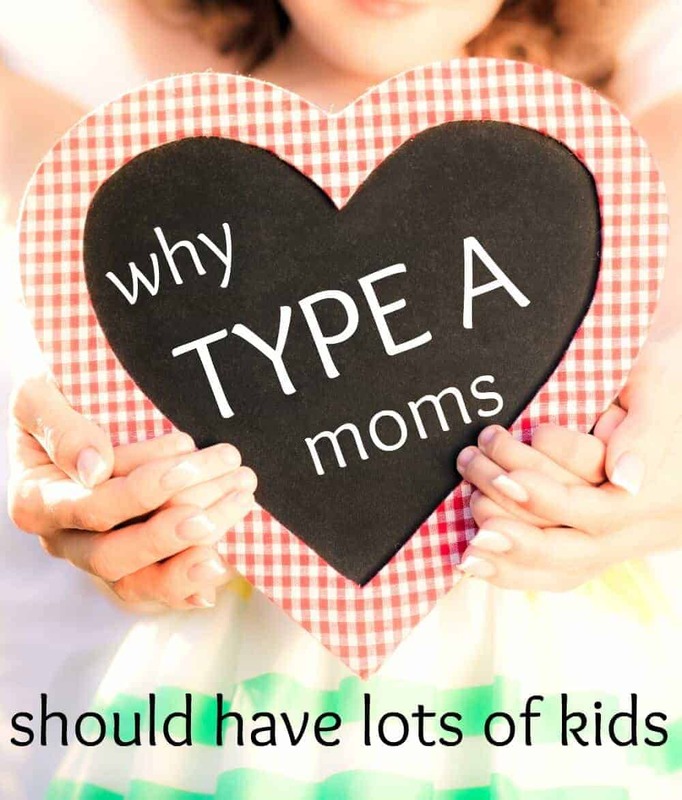 Type A moms aim high and expect others to do so as well. Of course this isn’t good if we’re asking for unrealistic things from our kids, but when we’re encouraging them to try hard and persevere, it’s a great great thing. 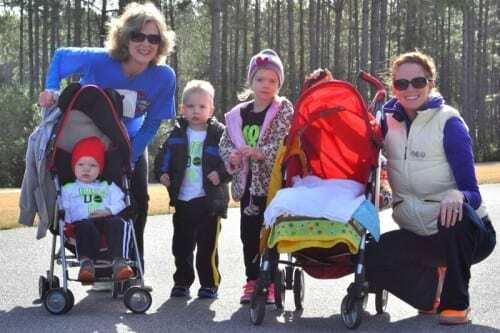 So, Type A lady, if you are feeling burdened by your Type A-ness… well I’m here to tell you that having more kids has helped soften some of my rough edges. It’s helped me stop thinking I was in control when really God is in control. It’s helped me try my best, but let it go when I mess up. It’s helped me realize that my rewards in heaven aren’t based on how clean the house is or how straight the closets are. And because of that I’m released to enjoy the small things instead of fret over them. I’m released to be me instead of trying to be perfect. I think this entirely new and mostly pleasant phenomenon is what is often referred to as balance…. and I think I like it. Hi, I am a total A type and it’s making the whole family’s like hell :( I just can’t let go of control ! I just have two kids (three and 1,5) and already loosing my mind… any advice ? Marine, what I learned and finally had to do was see how the controlling wasn’t helping anyone (myself included) and I gradually just let things go. It’s still a struggle, but you can’t do it all! Have we met? Because you totally described me! I am very inspired by your balance between deternination and letting go. Sounds like you have found a way to still be your Type A self while modifying for your family and your sanity. 3,2, 18 months and newborn?! You are truly blessed! I hope I can convince my husband that we need more ;) (we have a 2 year old and a one year old) Thanks for sharing your story! Tara, ha thank you :) We can meet one day! I definitely try for the balance, we must aim high huh? Love tha tyou have a 2 and a 1 year old, what a blessed mama! I am so, SO glad I found your site. I’ve been struggling for a while with not understanding why my husband isn’t more Type-A like me! We have a 3 year old and a 2 year old, both foster boys (my idea, of course) and it’s been such a learning experience! Stressful at times, but I love every minute of it. I am an INTJ, type-A with multiple “look toward the future” strengths in the Strengths Finder test. Thank you for putting into words what I’ve struggled so long with understanding about myself, my husband, and my kids! Hannah we are like nearly twins. I’m ENTJ with the same future tendencies. The struggle is so so so so so so real! I am so fascinated by this. I really believe I’m Type A in many ways yet I was not born organized. I have been working *so hard* to get organized for many years, and I am getting there, but it does not come naturally. I think if I clean the bathroom it should stay clean for more than a day. Ha! I think it all hit me when I got married and then became a mom. I must have had neat roommmates…they always agreed with my cleaning plan. Yes, I always asked my roommates to agree to a weekly cleaning plan. Even in the dorm. I guess that shows I’m type A right there. :) In some ways I feel like I’m too laid back and when I was single I *thought* I was laid back. But I’m pretty sure my family would say I’m type A. Even though I have to work at organizing, I do not like to be over-busy, and I am not overly competitive (at least compared to my family! ), I am always striving toward being better at all I must do. This is really interesting. I’ve always considered myself one of the laid back siblings, but I think it is just that compared to my super extreme type A siblings, I am. Thanks for the great food for thought! This is so true (especially the part about children “forcing” humility on you). I have 5 children…and I honestly never really thought about having more than 2 (maybe 3). I think God partially gave me so many because I was calmer when they were little – they were my excuse to slow down. Now that the youngest is 3 though, I feel my “must achieve” engine revving up. (I stay at home and home school, so there are lots of checklists I could be checking and comparisons I could be making…) I’m excited to explore your site/articles more. I really appreciate this post. God hasn’t blessed me with a lot of children, in fact I only have two a 11 year old boy and a 5 year old girl. However my girl has made it to where I have had to soften my type A edges because she has Cystic Fibrosis. We had her while my husband was still serving in the army and I had to learn quickly, that my house was no longer going to be the way I liked it. Of all the things you listed for me one of the hardest to learn was #2, I learned that this year and not feel like a failure asking for help from friends and family with my oldest when my daughter was in the hospital and my husband was away for army missions. I think God finds ways to help us type A’s be softer and more understanding, not always with a lot of children, I would love to have more but we are waiting on God, it could be just one child that has more needs that we are blessed with. Kimberly, I think that children softening our edges is a good thing,e ven though the struggles they are going through are not. I think you are right taht God can find ways in any area of our lives, can’t he? Blessings to you as you raise your littles so close together! My middle two are right at a year apart, so I have a glimpse of what that’s like! Shari, our personalities like to be in charge, what can we say? I agree, we gotta let God lead! I love this! I am definitely a Type A and Enneagram 3, so I struggle with the lack of “achieving” I do staying at home. We do want lots of kids and are expecting #2 in the spring, and as crazy as it sounds, this post encourages me. I feel like it’s just going to get better with each kid!